17% O2 is like being at 2000m altitude. Humans can survive permanently up to about 5000 or 6000 meters, which is a pressure of about 55-50% of sea level, or 11% O2 concentration at sea level pressure. You would feel effects if subjected to that immediately (even fatal), but you can acclimate to it. Maximum CO2 of a few percent is good. 5% is where it is considered toxic, but even at 1% you feel effects -- basically increased breathing rate and some tiredness. Maximum O2 is harder, there's actually no hard established limit to my knowledge. We can breathe 100% O2 for a little while, but it does have toxicity in the long term. For permanence, probably 30-40% is safe I would guess. So now I need to say this is my new earth, but now we need breathing masks because the universe had to make us oddballs . Hahaha. Well, we are the product of life evolving on this planet -- naturally we are suited to this kind of atmosphere, and not most other atmospheres that you might find out there. Keep looking! I'm sure there's another planet with breathable atmosphere somewhere. it's kind-of hard, when i search within a 5,000 ly radius of earth. hey. I guess I found two planets and a moon. one is oxygen ladent (main gas), two others are more carbon ladent. the oxygen one is pretty much a proto-life earth with unicelluar marine life, and is only 441,543,000 years old. the other two are more earth like in age. The moon has an extremely long day, longer than it's year, 25 day year to a 128 day rotation. the solar year on the moon is roughly 48 years. the carbon ladent planet has red oceans, so I presume more mineral water to carbonate and overprice XD. 30-40% O2 is certainly something life can adapt to, and have. The maximum of 35% was reached towards the end of the Carboniferous period (about 300 million years ago), a peak which may have contributed to the large size of insects and amphibians at that time. also the highest carbon dioxide in earth history was 7,000 ppm in the Cambrian period 500million years ago. Oxygen above 30-40% would not be very safe for humans. While insects may handle that change well, humans may not. Oxygen can easily become toxic, especially at low air pressure. A fifth fundamental force of nature!!! What credibility does this have? Should I start telling my friends and rolling on the grass of some hill? Looks very promising, but I would wait a bit more. This is an interpretation of something weird in their data, and if we are to be convinced of the interpretation it must be verified through its own predictive power. It could also just be something wrong with their experiment or analysis; they must be replicated elsewhere. Actually, I am surprised that no one predicted this fifth force. Or does anyone? But if there is 'dark matter' - which seems to interact with nothing, except gravity - one might assume that there is also a 'dark force'. A force that interacts almost exclusively with the 'dark matter'. If this is so, the occurrence of these particles might indicate the presence of 'dark matter'. It could also just be something wrong with their experiment or analysis; they must be replicated elsewhere. always wonder: if the sun temp was lower by 10-100kelvins. would earth be colder in that temp range too or it wont affect at all? Okay, let's derive it. This is a beautiful application of geometry and physical laws. Let the equilibrium temperature of the Earth be defined by the balance of energy in and energy out. The energy in is the solar flux at Earth (luminosity of the Sun spread over a sphere with the size of Earth's orbit), times the cross sectional area of the Earth, times the fraction of the radiation absorbed (one minus the Earth's albedo). 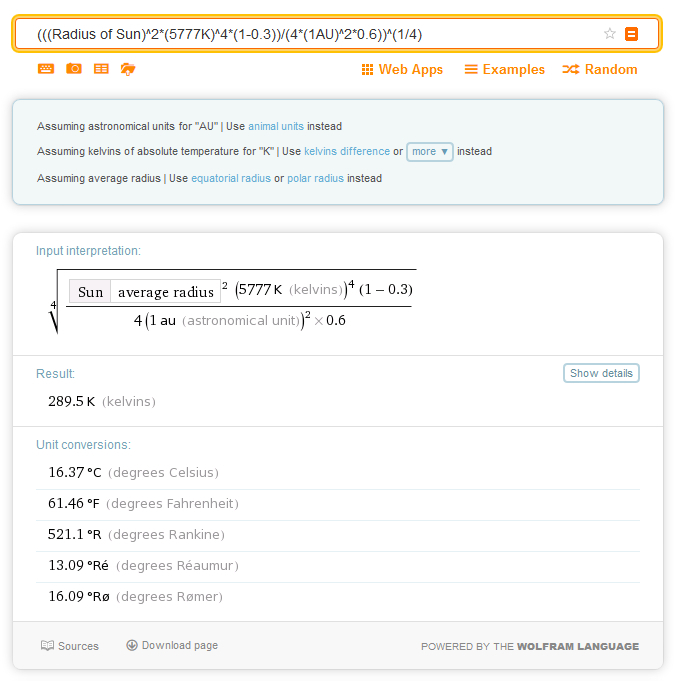 The energy out follows a simple radiation law for a blackbody -- it is proportional to surface area and temperature to the 4th power, with a proportionality constant (Stefan-Boltzmann constant), and a factor for the radiative efficiency, epsilon. For the Earth, epsilon will act as a greenhouse parameter, and takes a value of about 0.6. The luminosity of the Sun can be found in the same way. Epsilon for the Sun is about 1 -- very close to a true blackbody. If we plug in values, this returns an equilibrium temperature of the Earth of about 289K. 255K with no greenhouse atmosphere. Now let's see what happens if we vary the Sun's temperature. We can see the dependence is linear (4th power of sun temperature to the 1/4 power), if all else is constant. Differentiating with respect to Sun temperature, we find that the Earth's temperature drops by 0.05 Kelvin per Kelvin that the Sun is made cooler. Which we can also figure out by simply dividing Earth's temperature by the Sun's temperature: 289/5777=0.05. Of course, we must make a few notes. Stars don't always change temperature without also changing their radius, especially if we're comparing between different classes of stars. It's actually their luminosity that is more fundamental to determining the planet temperature. Another note is that the climate system may further respond to this change in luminosity and its equilibrium temperature, such as by changing the albedo or the greenhouse gas concentration. How young can a terra-type planet be to have marine unicellular life begin in it's oceans? In Space Engine, I find terras with life that are less than 1 or 2 billion years old. Do we have a date for the postponed Expedition 49 launch yet? Hard to say, but the timeline of life on Earth should provide a guide. Apparently, unicellular life can begin quite early if the conditions are right, but multicellular life possibly takes a very long time. Perhaps Earth was late with complex life, or perhaps not and this explains the Fermi paradox.